Tim Tebow will start the 2018 season at a whole new level. The New York Mets will promote the 30-year-old outfielder to Double-A Binghamton next week, a source told MLB.com's Anthony DiComo on Monday. Tebow, who was a non-roster invitee to Mets Spring Training this year, struggled in seven Grapefruit League games. The former NFL quarterback went 1-for-18 (.056) with a walk and 11 strikeouts, although he spent most of Major League camp battling a sprained ankle. "Unfortunately, I couldn't do as much as I wanted to with my ankle, which is kind of disappointing," Tebow told MLB.com earlier this month. "But I got to put in a lot of good work, and feel like I'm improving. So that's good." Tebow, who won the Heisman Trophy as college football's top player in 2007, signed with the Mets in September 2016 and split his first Minor League season last year between Class A Columbia and Class A Advanced St. Lucie, batting .226 with eight home runs, 52 RBIs, 24 doubles and a .309 OBP in 126 games. So, how did Tebow do in his first season? Tebow's presence in Binghamton should be a boost for the Double-A Rumble Ponies, who finished last in the Eastern League in attendance in 2017. Binghamton, which is about a 3 1/2-hour drive north from Citi Field, has been the Mets' Double-A affiliate since 1992. Tebow's mixed results last year didn't deter Mets general manager Sandy Alderson from pushing him along the developmental chain. 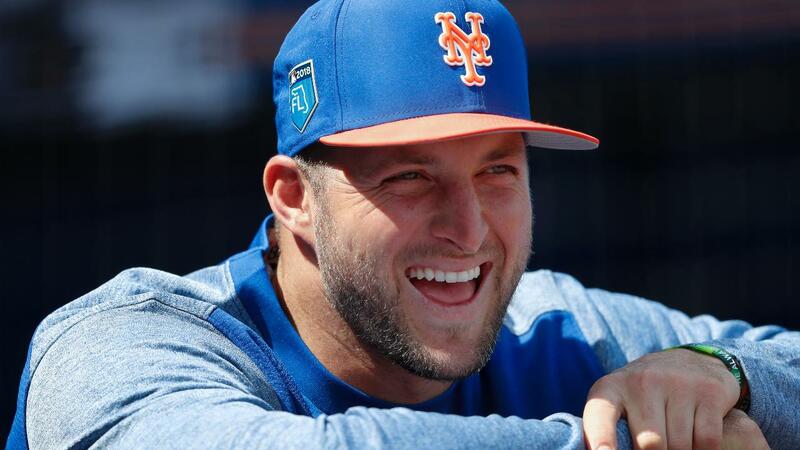 He was invited to Major League Spring Training earlier this year, and Alderson said in mid-February that he believed Tebow would eventually reach the Majors. "I think he will play in the Major Leagues," Alderson said in February. "That's my guess, that's my hope and to some extent now after a year and a half, a modest expectation. So I'm happy he's here. He's great for the team, he's great for baseball. He was phenomenal for Minor League Baseball last year." Indeed, Tebow was a huge draw at home and on the road in his first season in professional baseball. The St. Lucie Mets set an attendance record in 2017 after Tebow rolled into town, and the buzz followed him on the road across the Florida State League, even in a circuit that historically doesn't produce sellout crowds. "We're very pleased with his progress so far," Alderson said last month. "I think that this experiment on his part has evolved from when it first started and we signed him into something I think much more meaningful and with somewhat greater expectations. He's been super for us the first year-plus. He made progress on the field, he's dedicated himself to improvement, he spent a lot of time in the offseason, working with hitting coaches and so forth, a lot of time."